Becks and Brown Trout: A hard but good day on a chalkstream after grayling. 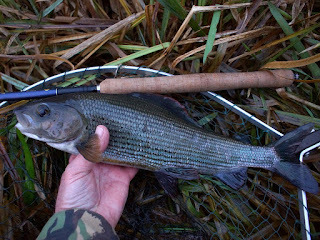 A hard but good day on a chalkstream after grayling. since the same trip last year was cancelled due to freezing weather which resulted in the following post. Well this wednesday the reorganised day arrived. It was somewhat overshadowed by the news from one of our party who is an accomplished angler and even guides on the beat when he had announced that conditions were tough, this translates as bloody difficult for us mere mortals. 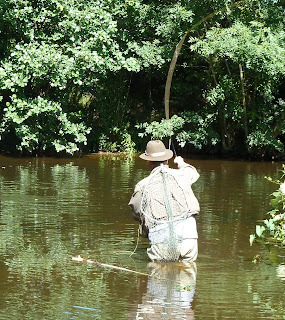 The river was very low, flow was canal like and this pristine of chalk streams carried an unusual murkiness that meant sight fishing to individual fish was very hard as the gravel bottom was silty and weed beds obscured the fish. day was great, interest and enthusiasm constantly refreshed and challenged by the glimpses of the large grayling that populate that stretch I saw several fish that must have been 2lb plus and the beat holds fish that greatly exceed that 2lb milestone. But at the end of the day I reflected on an enjoyable day. It was a lovely river with plenty of good fish there was good company and that ever present anticipation of what the next cast might hold and at the end of the evening there was even a fishermans sunset to send us on our way. Addenda : I fished this in late 2017 , sadly the decent levels of fish seem to have crashed and very few fish remain ..
enjoyed it immensely Andy, even though I was the only one to blank! That is one fine grayling on the ITO. Looks like a you had fun! I enjoyed the post, thanks!